3.1. Step 1. Think a little. 3.2. Step 2: Code a little. 3.3. Step 3: Think a little more. 3.4. Step 4: Code a little more. Nu följer en sammanfattning på svenska. Resten av dokumentet på engelska. refaktorera (speciellt dina fusk och skarvar). This text introduces SIMPLE, a framework for programming. It is not a design methodology. SIMPLE does not specifically address testing. This is not to be interpreted as testing is unimportant – quite the opposite, as will be clearer as we go. Use the specification in a structured manner to do both function design and data design. Work in an incremental fashion, by solving many simple problems instead of few complex ones. Always have a working program that you can run and test. Test continuously, preferably automated but at least manually. Write straight-line code first, before complicated branches and loops. Use tricks – cheating and dodging – to keep programming simple, and push problems into the future. To exemplify, we will be using an version of an old assignment on the course. The simple warehouse program is an information system for managing the contents of a storage facility for different kinds of wares. Every ware in the warehouse has a name, a description, a storage location, a pricetag, information about the number of items of the particular ware stored in the warehouse, and the cost of each item. A storage location is a “section” (a single letter a-z), plus a shelf (an integer). When starting the program, the user is presented with the main menu with the above alternatives and picks a choice by entering the first letter of each alternative, i.e., A, R, E, P, L, U, or Q. When choosing to quit, the user is prompted with a yes/no question: do you really want to quit? If the answer is Y, the program exits. If the answer is N, the program displays the main menu again. If the answer is anything other than Y or N, an error message is printed and the question repeated. The choice is again indicated by entering the first character of each option. The first alternative allows the user to re-enter one piece of the required information for a ware after which the editer ware is displayed again with the same question as above. The save alternative saves the information to the database and then returns to the main menu. The abort alternative returns to the main menu without saving. The rest of the actions on the main menu should be fairly self-explanatory. The most fundamental principle of SIMPLE is to always have a working program. By a working program is meant a program that compiles without warnings or errors, and runs. In the beginning, the program is not going to do anything useful, which is fine. The SIMPLE approach is all about adding functions to the program little by little until it suddenly is finished. By always having a working program, it is easier to test the program, and the most shallow bugs can often be caught by just running the program and spotting the error. Furthermore, working with a program that runs is generally much more humanly rewarding and avoids the scary feeling of “not having anything” for a long while until finally the individual pieces are connected and a program magically appears. I am supposed to write a program. Where do I start? This is exactly the question SIMPLE is trying to answer. Along with the question, when am I done? We will now proceed by walking through a number of steps, and stopping and recapping once in a while. 3.1 Step 1. Think a little. The most important answer to this question is about where you should not start: don’t start to code (yet)! Before we start to code, we should make sure to understand something more about the program. The goal is to make sure we have a basic understanding of what the program is supposed to accomplish, but not yet care about how it should accomplish it. To get a feeling for what the program is trying to accomplish, we mine the specification. This means re-reading it, looking for some particular kind of information. To understand the program’s core behaviour, we pay close attention to the verbs and actions. Using a pen to underline or highlight them is not a bad idea. For concreteness, I am copying in parts of the specification from above, highlighting as I go. The simple warehouse program is an for … letter a-z), plus a shelf (an integer). Looking at the text above, I have a pretty good overview of what the program is supposed to do at a high-level. Of course, this specification is extremely simple by listing the main menu with a lot of actions, but even if it didn’t, picking the actions probably would not be that much harder. Now, I take a piece of paper and write these things down. A mindmap is usually a good way to capture hierarchical structures. The mind-map tells me what actions that the program should support, but so-far nothing about how they should be implemented. So far, that’s fine. This is what we are doing: We are abstracting and compartmentalising. If we tried to understand the entire system before starting to code, we would probably never start to code, because it is very hard to know when you truly understand something. Some people are good at convincing themselves that they “get it”, regardless of whether it is true or not. Others are good at convincing themselves that they don’t. The key is to not get into a situation where this matters. At least not yet. What we are going to do is the following: we are going to alternate between thinking a little and coding a little. We are going to think just enough so that we understand what is a plausible next step forward. Then we are going to evaluate whether that was a good step or not by coding. This is good, because coding is a good way to understand sloppily formulated ideas. By forcing us to concretise, coding challenges us to understand what it is we understand. 3.2 Step 2: Code a little. This program is pretty much hello world, but it compiles and runs. Between each function you add, compile the program. Unless you are looking for trouble, or are writing live code in front of an audience and are desperately trying to come across as a human compiler, you really want to compile your code all the time. When you are new to a programming language, make a habit to compile after each edit. After a while, you will be able to go up to a few lines. Then a bit more, etc. The reason for this is to compartmentalise your errors too! If you write 100 lines of code before you try to compile, you are likely to get 50 errors. Unless you are hardened by experience, this can be an insurmountable and cause you to give up. The nastiest compiler errors always happen in the code you wrote more than one hour ago. Not because you were a worse programmer then, but because it was one hour ago! You probably don’t remember what you were thinking back then, so you have to work hard at retracing your steps. If you try to make sure the code compiles every two minutes, logic dictates that solving these bugs is way way easier. 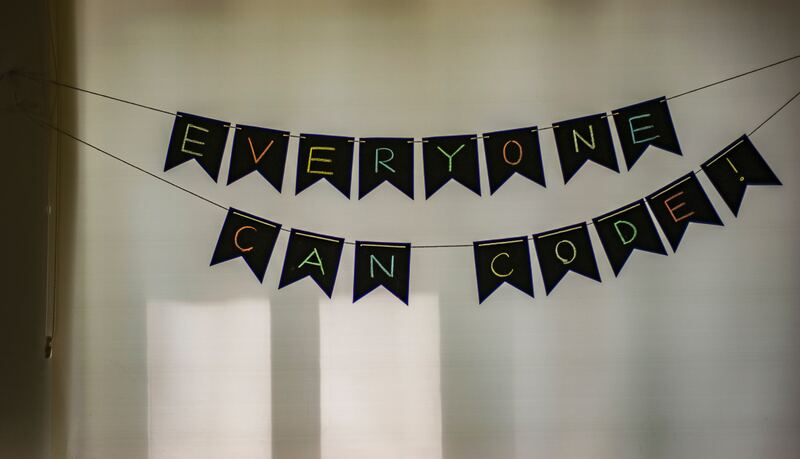 Good programmers likes easy. Address the errors one by one and in the order they were printed on the screen. Recompile all the time, and always after addressing each error. Since one error often create “faux errors” later in the code, it is a very good idea to recompile all the time while fixing compile errors. It may be that fixing one error closes all of the remaining ones. Also, it is not uncommon to introduce a new error while you are fixing another one, so recompile often to make sure that the error number goes down steadily. 3.3 Step 3: Think a little more. We now have a working program that does absolutely nothing. Let’s start adding some functionality to our program following the specification. The first six action all require either that there is some data in the program, or that we are able to add some data. We haven’t done any data design yet, so if we want to start with these, we should that. However, the last action, quitting, is very simple and does not do much so that is a good starting point. We now go back to our mind-map and extend the specification of quit. Re-reading the specification, we now know that triggering quit should enter into a confirmation dialogue, and if the user replies Y, then we quit, if N we return to the main menu, otherwise repeat the question. 3.4 Step 4: Code a little more. To keep the program as simple as possible, we are not going to add functionality for choosing an action in the main menu just yet. That’s not needed, because the only thing we are going to implement is quit. So, although it is futile, let’s extend the program so that when we run it, it asks if we want to quit. To this end, we will add a while loop that loops forever and that in each turn of the loop asks us whether we want to quit. This will allow us to test both the yes and no answers. Once this edit is done, we compile and run the program. Just to be sure we did not break anything. But oh, it does! quit_action() must first be updated to return a bool. We fix this and add a return false; as the default return and also include stdbool.h at the top of the file. If you don’t know immediately how to solve a problem, assume the existence of a function that solves this problem for you, and call that function. This is great because usually when you are programming, you are going somewhere and you have a particular control flow in mind. Getting stuck implementing one step of this flow usually means your train of thought is interrupted and because your mind is now focused on solving the current step, you will have a harder time continuing where you got stuck once you are unstuck. We can now compile and run our program as a kind of minimal testing. Increment 4 is dealing with the case of the user inputting a N. Turns out it is already handled, as the function returns false as a default. This leaves us with increment 5, which is the user replying with something other than Y or N.
The reason why I left this case until now is because this is the case that removes some of the simplicity of the code we have been working on so far: we must now add a loop to this function to be able to repeat the question. Note how I insert “paragraph breaks” into the code to capture what belongs together, and to help the reader “breathe”. Asking the question and getting the reply feels like two related concepts. The two checks of the exit conditions are clearly also related. Thus, I group these together by separating them with a paragraph, and also put another paragraph before the error which is the logical conclusion of the function. Also note that I removed the // TODO: implement comment since the function is now properly implemented, modulo the cheat – the call to the (yet) non-existent function. In our example, Y and N are equally basic but only Y leads to something interesting, i.e., exits the program. The non yes or no cases require retrying which is more complicated, so we delay those even further. In the end, the order is Y, N, and “the rest”. This means that any code that involves loops, you start by focusing on getting one iteration of the loop working in the working program. Once that is done, you can more easily wrap the working code inside a loop. Note that by this rule, the Y case would still be implemented before “the rest” even if Y called some other functions to save the database etc. Each increment should result in a working program. For example, when we implemented (skipped…) increment 4, we should also have changed the get_char_input() to return N to test this. And similar for increment 5. Now: back to the running example. We have finished quit_action(), but mostly because we cheated. To finish implementing this part of the program, we will now remove the cheat by implementing get_char_input(). However, the reason why we didn’t write this piece of code down immediately from the start was because we thought it was complicated and did not know exactly how to do it. So, how do we proceed now? Posix compliant operating systems have a man command that brings up the manual for a certain topic. For example, if you write man printf, you will get the manual page for printf and associated functions. The associated functions bit is key – often you know how to do something related, but maybe not this particular case. For example, you may know how to read formatted data from the terminal with scanf, and then you can use man scanf to find out about fscanf that reads formatted data from a file. The man pages are a great tool to know because they are such quick access to information, usually at a much higher quality (but less specific) than Stack Exchange etc. You may have a text book on the subject. If so, great. Figuring out what to look for might be tricky. You first have to make the connection to I/O, and then you must go through 50 pages to find a mention of the specific functionality you are looking for. However, if you do, a text book usually gets you there. As long as you are doing something quite basic. This is usually the easiest option. And a really good one at that. A problem with code from Stack Exchange or random blogs is that you may not always understand exactly what the code does, and why. You normally end up with 40+ suggested solutions to your problem, 10 of which use libraries that you don’t have or know how to include, another 10 that you cannot get to compile because of reasons, leaving another 20 which you must somehow chose between. So how do you do that? Actually, in the same way as with the text book or examples from man pages: you try it out. Here is the golden rule of trying code out: start with a new empty file that just tests the code you’re trying to get to run. The reason for this is compartmentalising. It may be that the reason why you are stuck on something is because there is an error in your code somewhere that breaks some part. Pasting random code into the place where you believe that the error is, will probably not uncover anything. It will just cause you to go through all 20 versions and (erroneously) conclude that none of them works. Also, by isolating the code you are looking at in a single file, there is a lot less disturbance. You want to be working at all times with the smallest possible thing that can work. Remember: good programmers like lazy. This program will call get_char_input() and print out the character between single quotes to avoid confusion. We can now spend the next 15 minutes on getting the code that we are finding online to work in this file, and then simply copy get_char_input() across to our other C file. The easiest way to understand how something works in programming is generally to test it out. To that end, make it really easy to start with an empty file, compile and run it. This could be hacking your editor, downloading a plugin to your IDE, or saving an empty file plus makefile in a directory that you simply copy to make a new “testbed” for something. Understand that testing something out simplifies life tremendously, and that all minutes spent on simplifying simplification simplifies even more. Now that we are done with quitting the program, it is time to move on to the next action. However, in order to get to the next action, we must first extend the main loop of the program so that the user can choose between whatever action we choose to implement next, and quitting. // Hmmm ... code formatting? Here, I added printing of (part of) the main menu, a call to get_char_input(), and I also changed the code a little to make use of a should_quit() variable to control whether the main loop should continue or not. The reason for this is simply because code with fewer exit points is simpler to understand. However, looking at this code and the code for quit_action(), I notice that there is a small modicum of repetition. In both cases, I have to handle the failure mode, i.e., when the user presses something that isn’t part of the protocol. Now, we can compile and run the program again, and test that it works to trigger add_action(), which will print “Add action is not implemented yet”. Time to implement it! A good candidate for this is adding a ware, because editing, removing, listing, undoing, etc. all presuppose the existence of some data in the database. Adding something new is often simpler than editing or removing. This means that is a good place to start. We have now arrived at a good place to do some data design. In other programs, we might have started with that if there weren’t any functions that did not manipulate any core data for the program. But what do we mean by core data? Unsurprisingly, perhaps, the program’s core data is the central data for the program. A complicated program might have tons of different kinds of core data, but in our example, we are more lucky. To understand a program’s core data, we simply mine the specification again, this time looking for nouns. Let’s do that now! Every ware in the warehouse has a name, a description, a storage location, a pricetag, information about the number of items of the particular wares stored in the warehouse, and the cost of each item. A storage location is a section (a single letter a-z), plus a shelf (an integer). By cheating a little, we now have a type ware. However, in the interest of making progress and working in an incremental fashion, we are also going to apply another great simplification trick: dodging. Getting information from the user at all is a great first step in an incremental development methodology. Once that is done and works, we can start caring about making sure that the information is correct. It is time to dodge. Dodging means temporarily simplifying the specification. In the current example, a good dodge is to say: for now, I am going to only store string data in wares, and worry about integers and storage locations later. This allows us to use a single function for reading input from the user to complete the entire specification for adding a ware, modulo saving it to the database. And then we can make a version of get_char_input(), for example get_string_input(). We will probably also cheat and assume its existence on the first pass through the code. We will also cheat and assume the existence of a add_to_db() function, which does nothing except prints out the obligatory disclaimer of it not yet being implemented. Here is a list of suitable steps for almost implementing add_action(). Each step notably results in a program that can compile and run, but probably does not do anything useful. Read all the inputs as strings and save them into a ware object, assuming the existance of several functions (This could quite possibly be several increments. ): a. get_string_input(), b. print_ware() (to print a ware to the user before answering the save, edit, abort), c. edit_ware(), (for when the user selects edit above) and d. add_to_db(). In 1. above, we are writing straight-line code. No loops, and the only branching is the calls to edit_ware() and add_to_db() based on the users input. This means we do not yet implement the case where the user makes an edit, gets a printout and makes the edit again. This support we add in this step. Make price and amount ints in ware and replace the two calls to get_string_input() with calls to an assumed get_int_input(). Decide how to do the storage location. And implement that. This is likely several steps given that we cheated on the type for storage location before. The last thing we will do is to deal with the database – a final piece of the puzzle missing to finish this action. There is however one very important realisation at this stage and that is that right now, it does not matter (right now). The rationale is that we are trying to piece by piece construct a piece of software that fulfils the specification. We are just about to wrap-up the part of the program that will be adding the first item in the database. We don’t have the code to remove items, edit them, etc. So really, we could not care less at this point how the database is designed. The first database design will allow implementing everything except adding and removing with multiple wares, and listing multiple wares. The second design will allow us to do all that. The third design will make the program less of a Mickey Mouse program. We want to create a db_t value in main. We want to pass a pointer to the db_t value to add_action(). We want to pass a pointer to the db_t value to add_to_db(). And now we are done with add_action(). Think/code/refactor/remove cheats. Repeat until done. Find a good balance. Almost all hard problems can be broken down into less-hard subproblems, which in turn can be broken down to even less-hard subsubproblems, etc. After a while of breaking work down into smaller and smaller tasks, the tasks finally become simple, and that is the right time to start solving them. That’s SIMPLE in a nutshell. As soon as we hit a bump in the road – a problem we don’t know immediately how to solve, or don’t know how to solve well, or just cannot be bothered with solving right now – we keep things simple by cheating and dodging. We reserve ourselves that right by always making clear notes about our cheats and dodges and by promising ourselves that we will set things straight in the future. And by keeping our promises. Mine your specification for data (nouns) and actions (verbs – behaviour/functions). Make simple drawings, e.g., mindmaps, to record your insights. Making things look easy is almost always good. …not to drive the thinking! Thinking should invariably come before coding, especially thinking about how you check that your thinking is valid. In combination with cheating, this usually means inserting dummy functions. Fix errors now, not later. Fix errors one by one. Fix errors in the order they were printed. Take time to actually read the compiler message so you know you are fixing the right thing. This requires always working code – preferably in combination with automated test that don’t involve ocular inspection, etc. Only start solving problems when they start feeling easy. Make a task for each problem or subproblem to put on the stack, take tasks from the stack in a reasonable order (preferably easiest first); when the stack is empty – you are done! 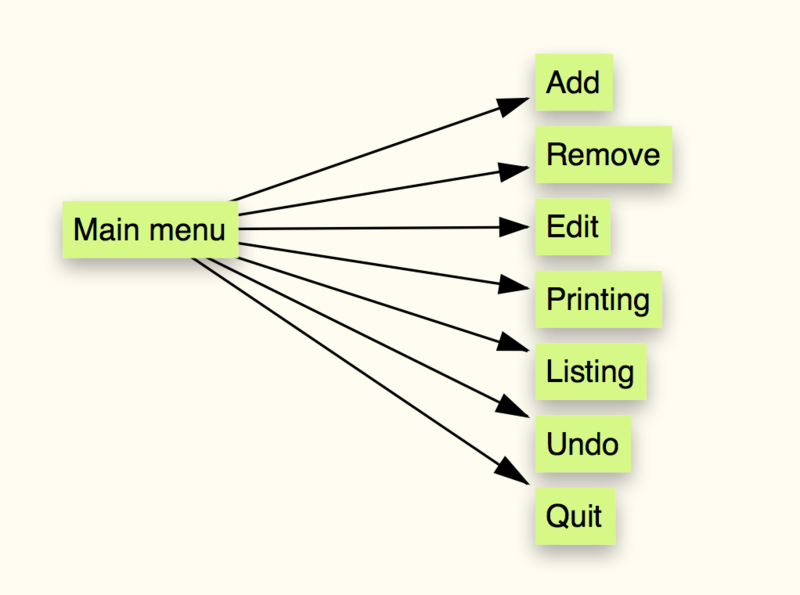 Generate new tasks to put on the stack as you go. If suitable, start with a straight-line version (without any if-statements). When the straight-line version works add conditionals, one by one. Start with the most basic or the most insteresting cases. When you are writing a loop, do the above steps first and add the looping step last. Don’t forget to push new tasks on the stack that undoes the cheating, later. This records the cheat, which is great. Don’t forget to push new tasks on the stack that undoes the dodge, later. This records the dodge, which is great. refactoring – especially to address your cheats and dodges. 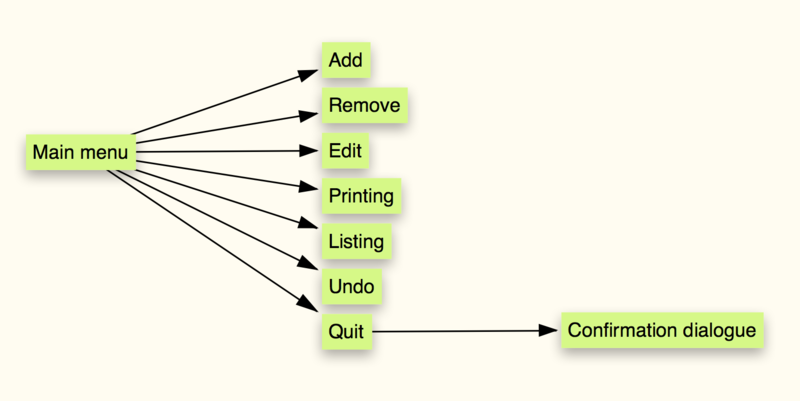 Refactoring is good to do between larger tasks. Make it a habit to continuously go back and refactor your solutions so that recently gotten insights rub off on older code too. Note that this is a simple programming methodology, not a fully-fledged software design methodology. This means that it will not scale to “large” software, but will work fine for relatively simple programs up to say a few thousand lines of code. Certain domains, especially mathematical domains, might benefit from more advance thinking before implementing because there are more “truths” in such domains than in more fickle domains, especially ones involving human users. Although the running example used a program with a user interface, SIMPLE works equally well with non-UI programs. Programming with SIMPLE revolves around breaking problems down into sets of smaller and smaller tasks. Actually, almost all programming works like that. Our first problem was “implement an information system for a warehouse”. This is a very big and vague problem, so to solve it, we perused the specification to find the top-level actions that the system should support. We thus identified a set of tasks, one for each action, and started working through the tasks one by one. We carefully chose the order of tasks to make sure that we started as simple as possible and never worked on a task that could not be a part of the running program because it relied on another feature that wasn’t quite ready. We are following a divide-and-conquer approach, where you recursively break down tasks into increasingly smaller pieces until each piece is trivially solvable. As is visible, from the steps above, we do not strive to break everything down into simple problems. For example, we started by doing quit_action() as soon as we realised it was simple enough, without caring about breaking down everything else first. The more you implement the program, the more you will understand it. You will never understand the program less than right at the start – therefore, trying to make a detailed planning with that limited understanding is a bad idea. Instead, tasks will be created as part of the implementation. At every step of the way, you will have a pile of tasks to perform. When this pile is empty, you’re done. Naturally, tasks are sometimes created because you forgot to create them elsewhere, or because of misunderstanding, etc. Actually having a physical pile of tasks in front of you is not a bad idea. It is quite common in modern software development organisations to rely heavily on post-it notes for task planning and follow-up. You will have one or two post-it notes that you are currently doing, a growing pile of post-it notes that are done, and one pile that’s next. Physically moving something from doing to done or seeing a large stack of notes in the done pile is gratifying. Physically moving something from next to doing reifies a commitment. Glancing at a number of post-it notes in the next section of the paper or whiteboard where you keep your tasks is a quick way to get an overview of where you are headed. Using a physical stack of post-it notes or some equivalent software is an excellent way to manage the constantly growing and shrinking tasks. Of course, adding notes in the code is great too, but why not both. Regardless of how you manage your tasks, an important question is where you put new tasks when they are created – to the front (so they are next in line) or to the back (so they won’t be dealt with for a while). There is no simple rule but there is a SIMPLE guideline: simpler tasks go in front of more complicated tasks. When you test your software, you may run into bugs or defects which aren’t of immediate importance. For each defect that you do not immediately fix, create a ticket, and put that in the task queue. A ticket is a task like any other, just one that’s about fixing something that’s inadvertently broken. Creating tickets for defects is a good way to avoid breaking the current flow by switching into debugging mode, and helps us remember it so it eventually gets fixed. In addition to help you stay focused on the control flow you are implementing and not get stuck in details, cheating has the automatic side-effect of breaking down your code into smaller chunks. It also isolates trickier code inside single functions. For example, the logic for reading user input is now nicely encapsulated inside the get_char_input() function and we can solve this problem completely in isolation of the rest of the code for quitting the program although that code depends on it. By giving a proper name to each function invented by cheating, we make sure that the code reads more high-level, and it also helps us remember what problem the function in question should solve. and getting that to work. Dodging involves simplifying the requirements temporarily in order to create a simpler specification. The word temporarily is key here, and it is imperative that we have some system in place to help us remember what simplifications we have made to make sure we roll them back at some point and replace them (step by step) with the full specification. in this very order, which is the ascending order of complexity. That is is the fact is easy to see: all input is a valid string; integer input may fail if the user types something other than a number; storage location requires two different inputs to be correct. Finally, by starting with a database with only one item we have just enough to be able to have a working program in which we do pretty much everything except have more than one ware in the database. The logic for everything except writing to the database should be exactly the same for the entire program regardless of whether the database is an array of wares, a binary tree, etc.